Online fundraising solutions for international organizations. Grow from one team to thousands of groups taking action for your cause. Multi-level administration and reporting throughout. Open to organizations in 190 countries. Hundreds of currencies and payment types accepted directly to your bank account. Pay with Empowered! We provide you with a system to purchase humanitarian airfare with donations. What Makes Empowered Different? Our Platform Grows with You! 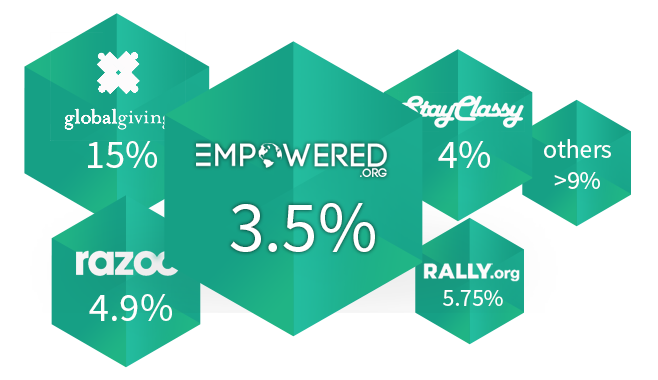 Empowered.org recognizes that organizations want to keep their branding, and we seek to provide as much of an opportunity of organizational branding as possible. We work with you to set a budget and timeline expectations for such customizations. Straightforward pricing with no catches or gimmicks. We seek to provide the lowest transaction fees and setup costs so that the money raised by your organization is being optimized towards your mission. To do so, we also provide the option to pass the transaction fee onto the donor so your organization is not affected, and keeps the full dollar amount of a donation. So what does this mean? FREE fundraising! Ready to start mobilizing for your cause?